Mars Global Surveyor (MGS) was launched 10 years ago today, on 7 November 1996. The spacecraft reached Mars on 12 September 1997, and has been observing the ever-changing red planet over the course of the past 5 martian years. The Mars Orbiter Camera (MOC) has spent 10 years in the near vacuum of space—not bad, considering that the Primary Mission, at the time of launch, was expected to end in early 2000. Since September 1997, MOC has been acquiring new images that highlight the geology and meteorology of Mars; more than 240,000 images have been returned to Earth. A recent example, from 15 October 2006, is shown here. Two annular (i.e., somewhat circular) clouds are seen in the upper left corner of this mosaic of MOC wide angle camera daily global mapping images. To the right of the picture's center is the martian north polar cap. The image has a scale of about 7.5 kilometers (4.7 miles) per pixel. Annular clouds are common in mid-northern summer in the north polar region, and may result from eddy currents in the lower atmosphere. The appearance of such clouds happens every year; this year they came like clockwork within a two-week forecasted period, based on the previous 4 martian years of experience gained from MGS MOC daily global imaging. Despite their superficial resemblance to Earth-orbiting satellite views of hurricanes, these cloud features are not the result of strong winds, and they typically dissipate later in the day. The pictures used to make this mosaic were acquired less than 2 days before the MOC was turned off for MGS's fifth Mars-Earth Solar Conjunction period. During Conjunction, Mars was on the other side of the Sun, relative to Earth, and thus MGS could not transmit data (through the Sun) during the second half of October. 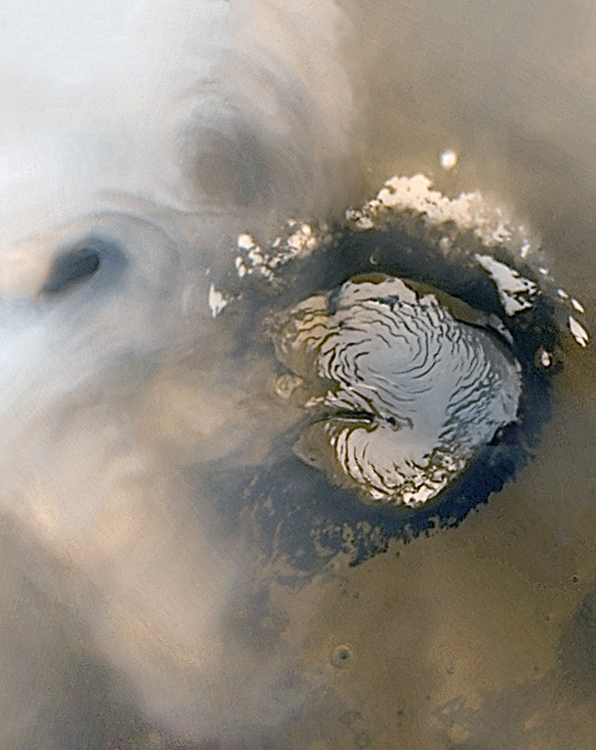 Examples of north polar annular clouds seen in previous Mars years were featured by the MGS MOC team in September 2005: "Celebrating 8 Years at Mars: Repeated Weather Events." To review the MGS launch of 10 years ago, one can visit the NASA Kennedy Space Center web site, which includes pictures and video at: http://science.ksc.nasa.gov/payload/missions/mgs/video.html. Video clips of the launch and many animations and videos from the earlier phases of the MGS mission can be reviewed at the Jet Propulsion Laboratory web site at: http://marsprogram.jpl.nasa.gov/mgs/movpics/anim/anim.html.